Great idea for Teachers and Workmates too! As well as picturing your family tree, this print could easily be adapted to make a great gift for a teacher showing all the children's names - or even a retirement gift featuring colleagues names. 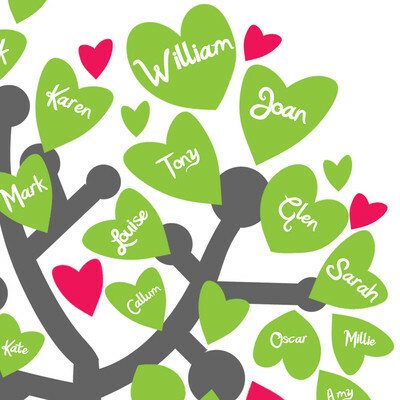 A tree featuring family members can include up to around 28 names, but a classroom or work-based tree layout can include up to around 45 names! Click on the gallery below to view larger images showing the different colour choices available. How it Works: To order, simply complete the form below to provide the names you would like to appear on your print. You can include up to 3 generations (ie, Grandparents, Parents, Children), with a maximum of around 28 names (Classroom Family Trees can feature more names - up to approximately 45 names). If you require over this amount, please contact me prior to ordering to discuss your requirements and I will be able to advise whether it is possible. When you submit the form you will be directed to the payment page where you can complete the order. After receiving your order I will contact you within 3-5 working days with a proof of your artwork to check before it is printed and dispatched. Your print will not be made until you have approved the artwork. Your finished print will be posted in a strong hard backed envelope and will require a signature on delivery. About your Print: Your artwork will be created to order and printed onto very high quality gloss finish paper stock. It will be posted with a backing board and smooth white finish bevel cut mount, and sealed in a protective crystal clear sleeve. 10"x8" £18.95 - the overall size of the mount is 10"x8" and will fit into any standard 10"x8" picture frame. A3 £24.95 - the overall size of the mount is A3 (420x297mm) and will fit into any standard A3 picture frame. Couples placed side by side. Older generation at the top of the tree, going down to the younger generation at the bottom. Siblings will be placed below their parents and beside one another. For example, in the close-up image shown here William & Joan are the grandparents, Tony and Glen are their children who have married Louise and Sarah. Tony & Louise's child is Callum, and Glen & Sarah's children are Oscar, Millie and Amy. For 1st Generation Grandparents, simply supply their first names. For example, "William & Joan". For 2nd Generation Parents please supply first names, plus the first name of their partner in brackets if applicable. For example, "Tony (Louise)" would mean that Tony is the son of William & Joan and he is married, or partner to, Louise. For 3rd Generation Children, please supply the name of their parent in brackets first, followed by the children's names. For example, "(Tony) Callum" would mean that the leaf featuring Callum is placed below those of Tony and Louise who are his parents. Please note that there is only space to fit around 25-28 names on the tree (45 names for a classroom or colleague style tree), so if you need more names than this please contact me to discuss your requirements prior to ordering. If you are ordering a classroom or colleague style tree please use one of the 'Grandparent' fields on the form for the main recipient (eg, the teacher's name), and any of the other fields for the names of the children or work colleagues. Got a complicated family?! Don't worry, as your artwork will be created especially for you I'm able to accomodate variations. If you think that the form below won't work for your particular family, simple fill out the name and postcode parts of the form only then proceed to payment. Once you have made your payment you will receive an automated email from me acknowledging your order within a few minutes. Just send me an email in reply to this message, giving me a break down of how you would like your family tree to be laid out. Don't forget that you will receive a proof before it is printed too, so you will have an opportunity to amend the layout slightly.